It's been awhile since I've done a canning post. The truth is, I haven't done a ton of exploratory canning lately. Last summer, it was all I could do to put-up a couple of batches of a few of our favorite items and that was about it. This summer has been equally as busy, but three things have contributed to a slightly renewed interest in canning. First, I've been a member of the Food In Jars Facebook Group, which is doing a monthly "Preserving Challenge" that encourages people to try new preserving techniques. While I haven't been able to cook and submit something for most months, I've loved being a part of the group, helping out with questions, and watching what everyone else is doing. Second, I've been participating in a CSA and planted a pretty large garden this year so I'm inundated with produce that we haven't been able to eat fast enough. That's caused me to do a little bit of preserving all summer. And third, my parents have been traveling and my Dad loves just about anything pickled, so he's been bringing all kinds of things home and going, "Hey, think you can make this?" And that's where this recipe was born. 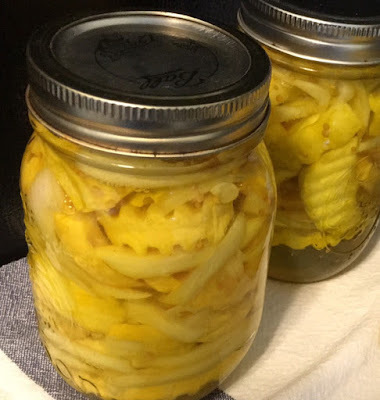 As they were passing through western Kentucky, he picked-up a jar of, "The Hitching Post & Old Country Store Squash Pickles," made with yellow summer squash. It's a sweet pickle, similar to a bread and butter pickle, which is totally not to my taste, but they seemed fun enough to try to make and I had some yellow squash that needed using-up. The ingredients label was simple and I was able to use another squash pickle recipe as a base. Plus, it had the added advantage of being a Low Temperature Pasturization recipe, which was one of the new techniques I'd been wanting to try. Win-win! So without further ado, I give you the recipe. This recipe can be made with either yellow squash or zucchini. I've provided alternate instructions for traditional boiling water bath canning if you don't want to try the low-temp method. Also, the turmeric is completely optional. It's only really there to give them that pretty yellow color. The crinkle-cut knife is also optional, but isn't it neat? Toss the squash and onions with the salt in a colander and set over a bowl. Cover with plastic and place in the refrigerator for 2 1/2 to 3 hours. This will allow some of the moisture to weep out of the squash and leave a less mushy product. Blot, but do not rinse the vegetables (you want to keep the salt). Discard any liquid that drained off. Select 4 clean pint jars and add 1/8 teaspoon of pickle crisp (if using) to each jar. Pack each jar with the squash mixture, leaving about an inch of head space. If you use small-mouth jars, the shoulders will help minimize floating. In a non-reactive saucepan, combine the vinegar, water, sugar, mustard seeds, turmeric. Bring just to a boil, remove from heat, and let cool slightly. Ladle pickle brine into each jar, leaving 1/2-inch head space. Clean the rims of the jars, add flat lids that have been soaked in warm water, and rings tightened to just finger-tight. Process using one of the methods below. Prepare a water bath canner and process for 10 minutes (processing time taken from a Food In Jars recipe for Pickled Zucchini). Fully submerge jars in water that has been heated to 120 to 140 degrees. Bring water temperature up to between 180 and 185 degrees. Using an accurate thermometer or an immersion circulator, keep water temperature between 180 and 185 for 30 minutes, adjusting heat as necessary. Remove jars and allow to cool overnight. For more information on low-temperature pasturization, see here. Generally speaking, it is considered safe for most pickle recipes.